The Cairns Region is spectacular from the air. To really get an idea of the sheer size of the Great Barrier Reef and the vast expanses of tropical rainforest you simply must see them from above. You can experience Cairns from the air as part of a Great Barrier Reef tour, choosing to fly one way or both or alternatively you could choose to do a shorter scenic flight. Scenic Flights are also available at any of the Great Barrier Reef pontoons. Full or Half day helicopter experiences are also available, as well as private charters. Enjoy a 40 minute scenic flight in a safe twin engined plane. You will fly over Green Island, Port Douglas, the Low Isles and Cairns Northern Beaches. Private waterfall experience by helicopter. Fancy a scenic flight? With options to fly over Cairns City, the Northern Beaches, Kuranda, Waterfalls and the Great Barrier Reef. Full day tour with a return Helicopter flight and cultural experience with the Kuku Yalangi, includes traditional hunting and spearthrowing. See the reef & rainforest from the air on this day tour. Includes flights, lunch and snorkelling. Fun, exciting and sensational! Microlights and Hang Gliders run tandem intro flights in and around Cairns and Port Douglas. Great Value scenic flights over the Great Barrier Reef and Cairns surrounding coastline. 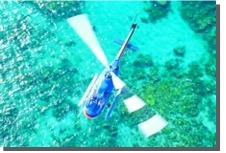 Scenic Helicopter flights from Port Douglas over the Great Barrier Reef, Low Isles, Mossman Gorge & more. Enjoy half a day on an secluded Barrier Reef island or an isolated tablelands watetrfall. Picnic and Champagne included!